Are you migrating QlikView Apps to Qlik Sense? Have you tried the new QlikView Convertor tool in QS 3.2? The QV Convertor tool is available from the Dev Hub in QS 3.2+. It’s a pretty slick tool that converts QV Variables, Dimensions and Expressions to Master items and converts QV charts to Master QS Visualizations. It does not attempt to replicate the sheets, but expects you to place the visualizations on sheets yourself as required. It’s a very useful tool with a good UI that allows for filtering and limiting what gets converted. At the Atlanta Qlik Dev Group meeting on July 13 I’ll be demonstrating the tool and presenting some tips and considerations for doing conversions. They’ve given me two hours (!) to speak so I’ll be covering several other topics as well. Added new computed field, “Expression Table Count” that identifies how many tables are involved in a given expression. 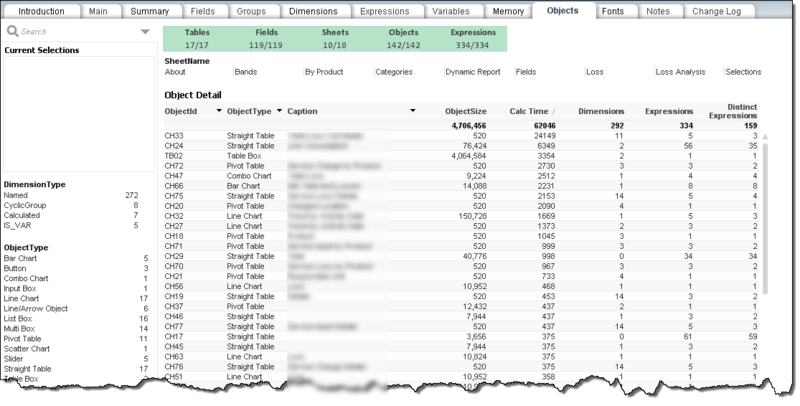 Expressions that use data from more than one table typically run slower then those with all data in a single table. Added “Like Objects Count” attribute for Objects, identifying candidates for linked objects. Copy Groups Utility V2 allows for copying groups within the same QVW. Script Log Analyzer V1.6 can analyze reload logs from both QlikView and Qlik Sense, Desktop and Server versions. Interface is available in four languages. Archiving (and retrieving) data models. Overcoming the “single binary load” restriction. Qvc.ExportModel — Exports all tables of the current model into a single QVD. Qvc.ImportModel — Import a data model created by Qvc.ExportModel. Even if you don’t have QVC V11 installed, you can try Qvc.ExportModel right now using http include. Add these lines to any QlikView script (instructions for Qlik Sense further on down in this post). Mind the wrap. The Must_Include should be on one line. Using QVC requires the Qvc.qvs library be included (usually at the beginning of script), CALLing Qvc routines, and CALLing a Cleanup routine at the end of your script. Assuming this script is included in “Sales Dash.qvw”, the default exported model QVD will be named “Sales Dash.qvd” in the same directory. The original model will be reconstructed as individual tables. 1 String. Optional. Relative or absolute directory where the model QVD will be stored. If relative, it follows the same rules as the STORE script statement for relative directory. 2 String, Optional. Name for the model QVD. If omitted, the name of the QVW will be used. For example, if QVW is “Sales.qvw”, then QVD will be “Sales.qvd”. 3 String, Optional. 1/0 True/False. If True, a timestamp of the form _YYYYMMDDhhmmss will be appended to the QVD name. Default if omitted is False. Qlik Sense has no default path so parameter #1, a lib:// for the QVD should be specified. Alternatively, if a lib has been established with a DIRECTORY statement, parameter 1 can be omitted. Qlik Sense will require a web file Connection for the http Must_Include. That’s all there is to it! If you are already using QVC, I hope you’ll find these routines a welcome addition to the library. If you are new to QC, explore more at QlikviewComponents.org. Thanks to Jörgen Peerik for raising the single-QVD export idea during a QVC class. Summary: I provide a tool to check your script for compatibility with QlikView version 12. This is because QV11 looks for the file in the working directory where the QVW is, whereas QV12 will respect the DIRECTORY statement and look in the Data directory. QV12 changes the way script EXECUTE statement is authorized. QVD*() functions respect the DIRECTORY statement. $(include) and $(Must_include) respect the DIRECTORY statement. How will you know if you have existing script that may be impacted by these changes in QV12? In an earlier post, I introduced the Script Repository tool which can be used to search script across QVWs. You can use the tool to search for potential issues. But I thought I would make it a bit easier by adding a dedicated “Version 12 Upgrade Check” sheet that does the searching and highlighting for you. The chart at the top of the sheet will list any document that has script that should be examined further. Select a document, press the highlight button and the script of interest will be outlined in yellow. My guess is that most customers will not have any compatibility issues. But why take chances? Be a hero and scan your script before upgrading. Join me at an upcoming Masters Summit for Qlik event in Johannesburg (6-8 Sept) or Austin (10-12 Oct). In my Advanced Scripting session, in addition to teaching important scripting techniques, we’ll look at methods and tools for managing your “script farm”. There are a number of reasons you may want to upgrade to QV12, I’ll be posting about them in the next few weeks. Today’s post is specifically about what you must address to upgrade to QV12. There are two items I’m aware of that you must be aware of and consider before upgrading. QlikView version 12 Server changes the default permission for the EXECUTE script statement More details in this post. 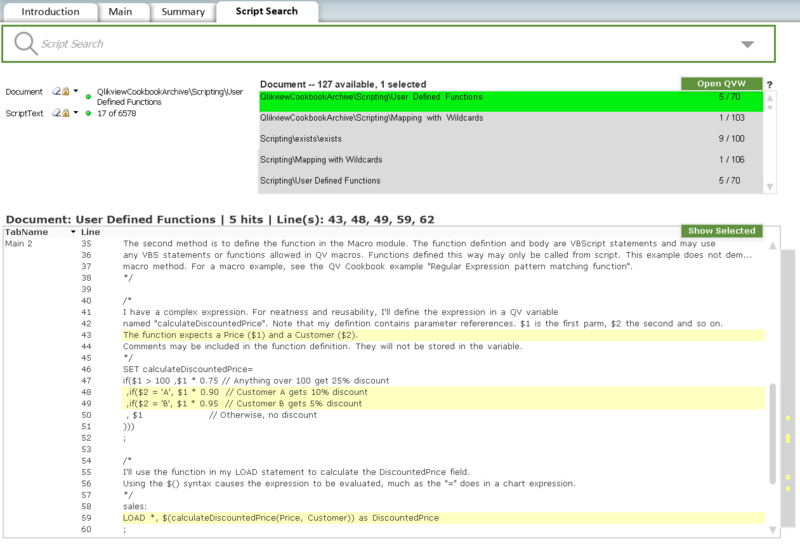 In QlikView 12, QVD functions now respect the DIRECTORY statement. This is a breaking change that may cause some of your QV11 script to return incorrect results or take incorrect conditional actions. More information in a post here. So again, I’ll be blogging about new features you may want to take advantage of, but above are the only two items I know of that you must consider before upgrading. How do you know if you are using the impacted EXECUTE statement or QVD* functions? Perhaps you already have a tool in place to answer that question. But if you don’t, my colleagues at the Masters Summit for Qlik are making the Script Repository Tool (“ScriptRepo”) available for public download. If you have attended a Masters Summit, then you already have a copy of ScriptRepo in your takeaways. if not, we would love to have you attend a Summit. But the Masters Summit Team understands the universal need for a tool like ScriptRepo whether you can attend the Summit or not. Press the “Extract & Reload” button and each QVW file in the input directory will be opened and the script extracted. The open is done with “nodata”, so the extraction runs relatively fast — about one qvw per second. After extraction, you can use your favorite search tool to scan the output directory, or use the builtin QlikView search & display from the “Script Search” sheet. I hope to see you at the Milan Summit in April 2016 or a USA location in Fall 2016. If you have questions about the Summit or using the ScriptRepo tool, let us know through the QlikView Cookbook Contact form or the Masters Summit Contact page. Ralf Becher has created a nice Icon Graph extension and used it to visualize Reload task structure within my QVPR Analysis tool. 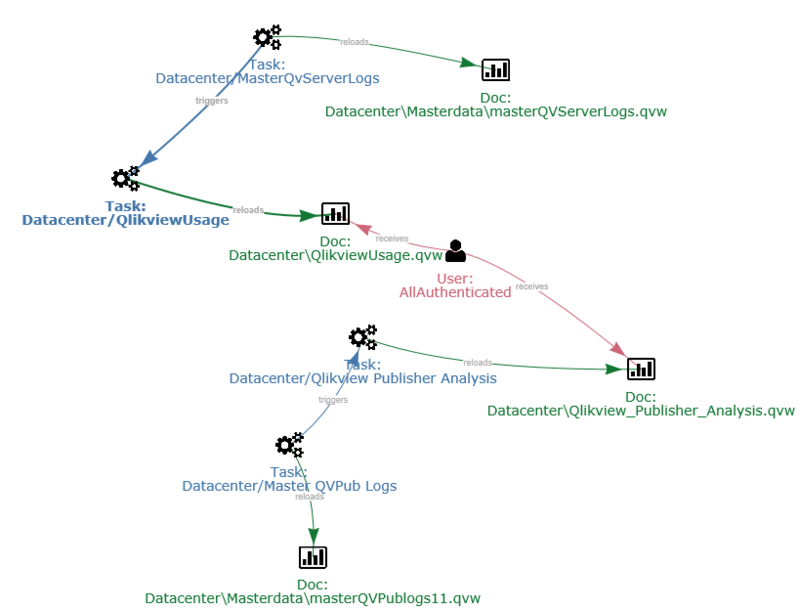 I’ve integrated Ralf’s script into V2 of QVPR Analysis and all you need to do is download and install the Icon Graph extension from https://github.com/ralfbecher/QlikView_Extension_IconGraph. Links are also provided in the QVPR Analysis qvw. Select some Tasks or Documents and you’ll get a visualization like the following. Ralf Becher has done some really interesting work with Graphs and Neo4J. Ralf is presenting a session (T56) at Qonnections on Wednesday afternoon if you want to learn more about using Graph models and visualizations in Qlik. DocAnalyzer is a tool to help tune the performance — response time and resource requirements — of a Qlikview QVW. DocAnalyzer can identify unused Fields and pinpoint slow charts. How do you use DocAnalyzer? After identifying the QVW to be analyzed. press the “Extract Metadata” button to begin the analysis process. When the extract is complete, you’ll receive a popup message. The extract can take anywhere from a few seconds to several minutes for documents with many thousands of objects. When the extract is complete, you must run a Reload of Document Analyzer. A button is provided for this or you can do Ctrl-R.
What can you discover in the analysis? Here are a few items. – The Fields sheet will give you an overview of what fields are used and unused and where they are used — Dimensions, Expressions, Variables, etc. A Listbox is provided with suggested DROP FIELD script statements for the unused fields. Select $date and $timestamp in “Field Tag” listbox. Examine the “Symbols Size” column in the Field References chart. Dates and Timestamps can be stored in 8 bytes, but frequently get converted to longer string representations during loading. The impact is only significant if there are a large amount of Distinct Values. – The Memory sheet provides an overview and detail of RAM requirements and estimates how much memory could be saved by dropping unused fields. – The Object sheet lists all Objects along with their Calc Time and RAM Size. Selecting a single object will enable a “Goto Object” that open the target document and Activate that object so you can examine it’s properties. There are many other areas you can examine such as the use and performance of Calculated Dimensions, Groups, Expression contents and what properties use those expressions. Document Analyzer is one of the Tools that Oleg Troyansky will present in his “Performance Tuning” session at the upcoming Masters Summit for Qlikview in Amsterdam Oct 1. I hope you can join us there for more performance tips and a chance to learn advanced Qlikview development skills. The Qlikview Management Console (QMC) is used to define Reload and Distribution tasks for your Qlikview documents. These definitions are stored in a set of XML files — the Qikview Repository (QVPR) — located in C:ProgramDataQlikTechManagementServiceQVPR on your server. What documents are being scheduled on a Monthly schedule? Weekly? What documents are using Dynamic Distribution (reduction) and what field controls the distribution? Which administrator modified this task and when? What documents are being distributed to group Accounting? How many documents are being distributed as PDF? Do I have logical errors in my QVPR? When was my server upgraded? I’ve produced a “QVPR Analysis” tool that loads the QVPR XML files and makes them available for Qlikview analysis to answer the above questions and more. You can download the QVPR Analysis tool from the “Tools” menu of QlikviewCookbook.com. The download link above contains some screenshots from the tool (names are scrambled in the images). You can load directly from the server QVPR folder or an offline local copy obtained from the server. The offline capability makes the tool especially useful for remote consultants who can analyze a customer’s configuration without having QMC access. This is the same tool provided to Masters Summit for Qlikview attendees last year. If you’ve already received a copy, no need to download again. I plan to continue enhancing the tool and will release further updates on QlikviewCookbook.com. The analysis is pretty much text and tables which has suited my needs just fine. I’ve used the tool several times to solve some tricky customer problems or get someone out of a jam. If you have Qlikview Publisher, you’ll get detailed information on Distribution tasks. If you don’t have Publisher, you won’t have distribution information but you’ll still get useful information on reload schedules and QVPR structure. If you build some new analysis or find the tool useful, drop me a comment. The Qlikview Document Alert feature is generally thought of as a way to notify users or administrators of exceptional conditions in the loaded data. But it may also be used for regular emailing of non-exception conditions, like daily sales figures. This can be very useful to inform mobile or travelling user of the status of Key Performance Indicators. The Document Alert feature is part of basic Qlikview. No additional software or license is required. Please note that that Alerts can only send out text email. They cannot send graphical charts or attachments. If you want that functionality, look to third party addons such as NPrinting. Alerts are a low cost and simple way to expand the reach and value of your QV applications. Users receiving emails do not require a Qlikview license.